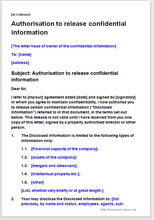 This authorisation letter lets you specify exactly who is entitled to receive your confidential information other than the person with whom you have made signed a confidentiality agreement. Use it to protect your interests. Signing a confidentiality agreement is only the first step towards protecting your confidential information. Simply put, a confidentiality agreement restricts the other party from disclosing or revealing your confidential information to any third party. An authorisation letter on the other hand lets you specify exactly who is entitled to receive the confidential information other than the person with whom you have made signed a confidentiality agreement. This authorisation to release confidential information to third parties (employees, agents, advisors or any other party you choose) ensures your confidential information is not passed into the wrong hands. Use it to protect your interests. Plain English - of course! Usual legal provisions to protect your interests. "Net Lawman provided a quick and easy solution for a reasonable fee."